2) What is international trade? 3) Why do people or countries trade? 4) Is trade always beneficial? 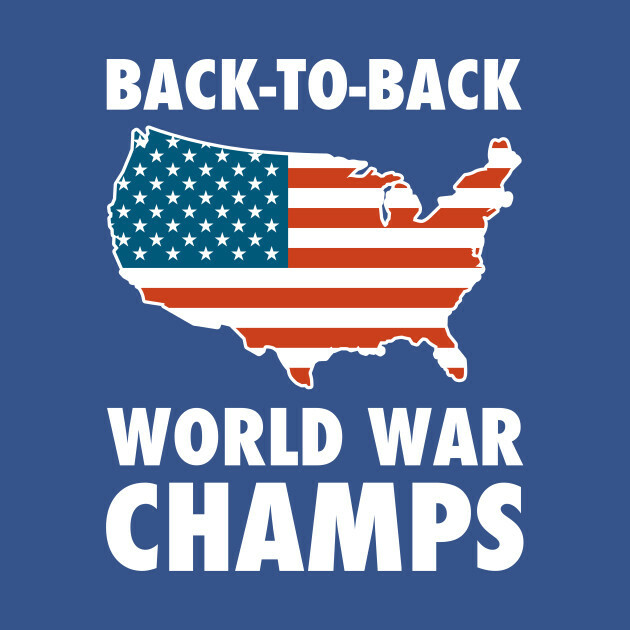 6) How do countries have an absolute advantage over other countries? ​8) How do you express the opportunity cost when solving an input problem of production? 9) What do the ratios represent when solving the comparative advantage? 10) How would you verbalize a ratio for comparative advantage? 11) How is the output method different from the input method when calculating opportunity costs? 12) What should countries do when they have the comparative advantage for producing a good? 13) Why does specialization help grow economies? SSEIN1 Explain why individuals, businesses, and governments trade goods and services. Trade refers to the exchange of goods, services, and/or productive resources among individuals, businesses, and/or governments. Trade refers to exchange among people within a country as well as international trade among people from many countries. Economic models suggest domestic and international trade improve a country’s economy. However, some individuals, firms, and/or industries experience difficulties as trading relationships evolve over time. As with all choices, costs and benefits exist. Absolute advantage refers to an individual, firm, or country using the fewest inputs to produce the same amount of output or the individual, firm, or country producing the largest number of units of output given the same productive resources. For example, imagine two countries, Jasminia and Lauraland, both producing MP3 players and Tablet Computers. In the example below, the problem presented is an INPUT problem because the numbers represent the labor hours used to produce one unit of each good. Since Jasminia only takes 10 hours to produce a unit of MP3 players while Lauraland takes 15 hours, Jasminia has the absolute advantage. In the case of the tablet computer, both countries take the same number of hours so neither has the absolute advantage. Now, imagine that Matthewtopia and Damianland are both producing MP3 players and Tablet Computers. However, the problem presented below is an OUTPUT problem because the numbers represent the number of units of each good they can produce given a fixed resource, in this case one hour of time. Since Damianland produces 9 MP3 players while Matthewtopia produces only 4 MP3 players, Damianland has the absolute advantage. In fact, Damianland has the absolute advantage in both good because it produces more of both per hour. While large, more technologically advanced countries will probably have an absolute advantage in production over smaller countries, both countries can still benefit each other through specialization and trade. The economic model explaining the how two entities can benefit from trade is the law of comparative advantage. Comparative advantage in production of a good or service exists when one individual, firm, or country has the lowest opportunity cost for producing the good or service. To illustrate comparative advantage, let us look again at the example using Jasminia and Lauraland. Remember, this is an INPUT problem because the numbers represent the labor hours used to produce one unit of each good. 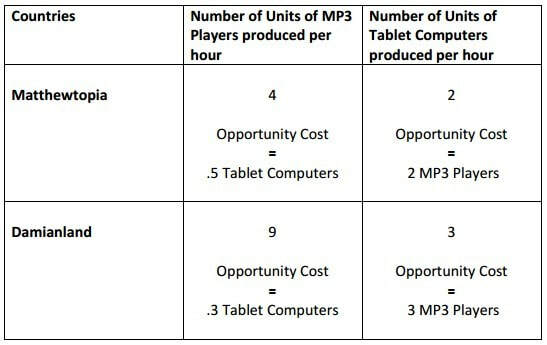 Use the labor hours to find out how many units of tablet computers each country must give up to produce MP3 players. For input problems, we have to express opportunity cost as the ratio of “what we are producing” divided by “what we are giving up”. The ratios in each box below represent the opportunity cost of producing each good. Since Lauraland gives up less to produce Tablet Computers, it has the comparative advantage in production. It should specialize in this product. Jasminia should trade its MP3 players to Lauraland in exchange for Lauraland’s tablet computers. By specializing and trading, both countries will be able to consume more goods than they could when they produced both goods. Since Damianland gives up less to produce MP3 players, it has the comparative advantage in production. It should specialize in this product. Tablet Computers, it has the comparative advantage in production. It should specialize in this product. Damianland should trade its MP3 players to Matthewtopia in exchange for Matthewtopia’s tablet computers. By specializing and trading, both countries will be able to consume more goods than they could when they produced both goods.